Decorate your home with this fabulous curtain panel. 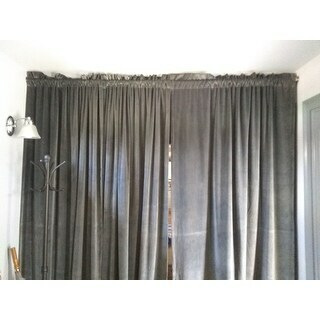 This polyester curtain panel comes in cafe, chocolate or black to blend with your home decor. The solid design adds to its stunning style. Who says you can't watch movies during the day. Now you can transform any room in your home into the ultimate home theater with Absolute Zero Home Theater curtains. The patented Thermaback technology is was developed to block 100-percent of unwanted outside light, while providing all of the luxury and style of naturally flowing draperies. Watch your favorite movies any time of the day, in the comfort of your own home, without intrusive light and noise. Reminiscent of classic movie theater style, these luxurious velvet curtains create the perfect atmosphere for at-home viewing. Whether traditional or contemporary, these home theater curtains offer versatility in color, design and style for the ultimate home theater enthusiast. 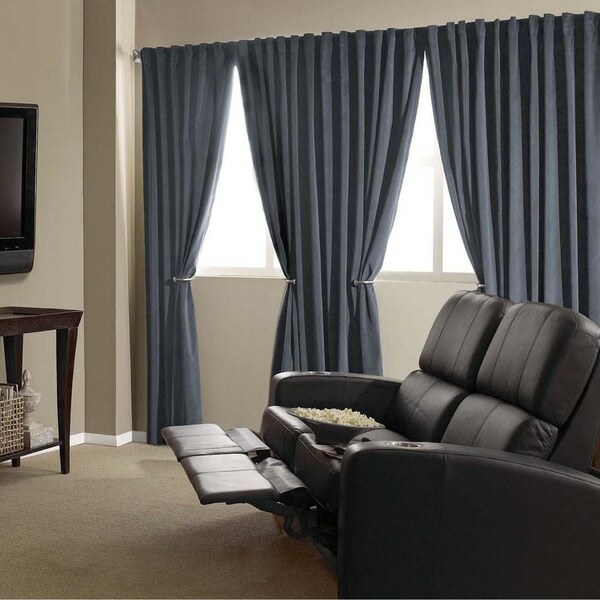 Customize your media room by hanging multiple velvet panels on a decorative curtain rod. Hang 3-inch rod pocket panel on 2.5-inch decorative rod, or achieve a more dramatic pleated affect by sliding rod through optional back tab loops. From the makers of Eclipse Curtains, Absolute Zero not only block light, they also reduce noise and have energy-saving qualities, making them perfect for any room in the home. Extra wide 50-inch panel is offered in extended lengths of 63-inch, 84-inch, and 95-inch. Velvet panels available in 5 fashion colors. Just what I needed for this room! Upstairs bedroom with big wide full morning sun windows. Bought 6 panels and sewed together three for each side of the window and it worked out great! I left a small space between the two large panels I created to show how well these worked for me. Sewing them together works well, just use a large stitch and start from the bottom where you could see any slight difference in length from manufacturer. I Hand stitched the top sections of the panel where the rod goes through to complete the finished look. Using a wrap around rod would have given me a tighter look with less light coming through the top but this works well enough for us. I though the price and quality was great and happy with my purchase. They are beautiful curtains and block out the light perfectly for my theater room. I ordered 6 of the 96 inch length and it fit perfectly over my 3 windows. I wanted the curtains to hang high and touch the floor. 96 inches made it look like my ceilings were higher in my room. 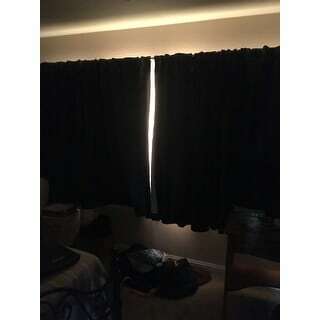 Over the last few years I've purchased several different pairs of "blackout" curtains, but none of them have provided a true blackout. 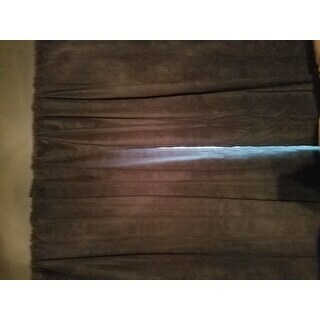 This is the first time a curtain that claims to be a blackout curtain lives up to that name. I give this 4/5 stars for 2 reasons: 1. This isn't really velvet. I'm not sure why they call it that. At best it should be referred to as felt. 2. This isn't a true jet black. Since this is in a theater room, I want things to be as absolutely black as possible. These reflect a bit of light during bright scenes, but it's minimal, and the true blackout nature of the lining.fabric more than makes up for it. They keep out all light, work great with wrap around curtain rod for home theater setup. Perfect, feel like suede color beautiful, darkens! The color was exactly what I was looking for!! Our room has never been so dark and we need dark for graveyard working day sleepers. Highly recommend. We also have a black set in our theater room and blocks all light from window. These are a few inches shorter than dimensions listed. I bought several panels of the Absolute Zero Velvet blackout panels for my daughter’s college dorm room, and they were perfect, Great quality too! Okay, we just moved from our own home into an apartment complex that has outside lighting that we can't control. Even though there are wood blinds on the windows, it was still pretty bright in there. I also purchased the recommended rod and spaced the curtains as recommended, even purchasing more width than recommended. Light still comes through above the rod and on the sides a little bit. No light comes through at all from the actual curtains though, they are quite heavy. Even though they are advertised as theater curtains they are pretty stylish. While not 'absolutely zero' light shining through I would consiuder the Chocolate color purchased abouit 98% light blockage. they are a drape on the heavier side compared to other Eclipse lines. Won't really know if it makes a differnce thermally until a few days from now, it is expected to be 90+ the remainder of the week. With multiple methods to hang the drapes it was easy to put them in place. Make sure you don't use the thinest rods if you are using a tension rod to hold them up. Look great but are way thinner than expected and ultra lightweight. The color indicate is different from what you Expect. They are truly black out curtains!! These curtains are soft, thick but not velvet. This is more like felt. We are putting them up in our home theater so we will keep them but had I known I would not have made the initial purchase. Also the black is a very soft black. Almost a gray black. Nice fabric and completely block out the light. Very happy with purchase. Drapes are very heavy and block sun and car headlight excellently! would recommend to anyone! We have a music room in our house and I wanted to dampen the sound so it is not blasting through the whole house. These curtains are thick and help with the sound dampening. They are not quite as thick at the kind in theaters but they do help. A bit stiff, but great at blocking light. We live in an apartment and the street lights shine right in our bedroom window. I've tried other black out curtains that did nothing to keep the light out but these actually did. The light comes in where the panels meet. these are worth every cent. incredibly dark. I use them in my bedroom. These curtains are beautiful. Great material in both look & feel. I live in Chicago and purchased for additional window insulation and can feel the difference in the room temperature since hanging. We got the 84" black velvet. They look great. A bit stiff but that's ok for our use. Only problem is that they're not 84". Ours are maybe 81", and we needed 84" curtains. Didn't want to screw around with longer ones that need hemming so we're leaving it as is for now, but it's a little disappointing. "Would these curtains work for a patio door? My room has slide doors are they big enough?" Most door panels are around 100” wide and 84” long, so while they are long enough, they may not be wide enough, depending on the size of the door. You may need to purchase more panels to get the full coverage you’re looking for. "What is another name for "cafe" color? I'm not looking for a "camel" color, but a beige is fine!" You can select which size you'd like in the option drop down. "Are these velvet? If so are they heavy or light? " They are velvet. I have them on each side of my screen in the movie room. They are a medium weight, I have them hanging on rods that are only attached at one end and swing outwards that are not thick and the curtains do not make them sag. It took me a long time to find some that were long enough and not heavy to prevent the rod from sagging. I hope this helps. Not sure if they're actually velvet but definitely are velvet/suede like. Very heavy and durable. Look really nice but due to the white lining on the one side, they need to be hung against a window or wall. "Is the back of the curtain white ? or the back and front black? I want to use it to divide two rooms but I want it to look black on both side." I used it for that purpose and it is black on the front and white on the back. I'm disappointed so not sure what to do now. Otherwise very nice quality for the price! "Are they coming in eyelet only? I would like to order In taped style"
"does this come with the metal "pullback rod" (not sure what to call I)) shown in the picture?" This does not come with a pull back rod.